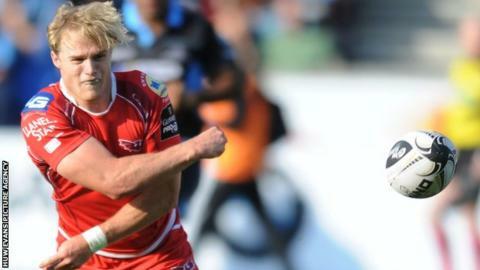 Scarlets scrum-half Aled Davies has signed a new contract with the Welsh region until 2018. The 23-year-old has come through the Scarlets youth system, making his senior debut in the 2012-13 season. He has made 72 appearances in all, scoring three tries, and took over as first-choice scrum-half last season in the injury absence of Gareth Davies. "The competition for the scrum-half position has helped me immensely over the last few years," he said. Scarelts head coach Wayne Pivac added: "He made great strides last season making the number nine shirt his own and has continued his form into this season. "At 23-years-old he is still very young and has years ahead of him; to see him continue his development here is great news for the region and for Welsh rugby on the whole." Davies has helped the Scarlets make a fine start to this season, winning six of their opening seven games in the Pro12. They host Italian side Zebre on Sunday, looking to bounce back after two successive defeats in the European Champions Cup.